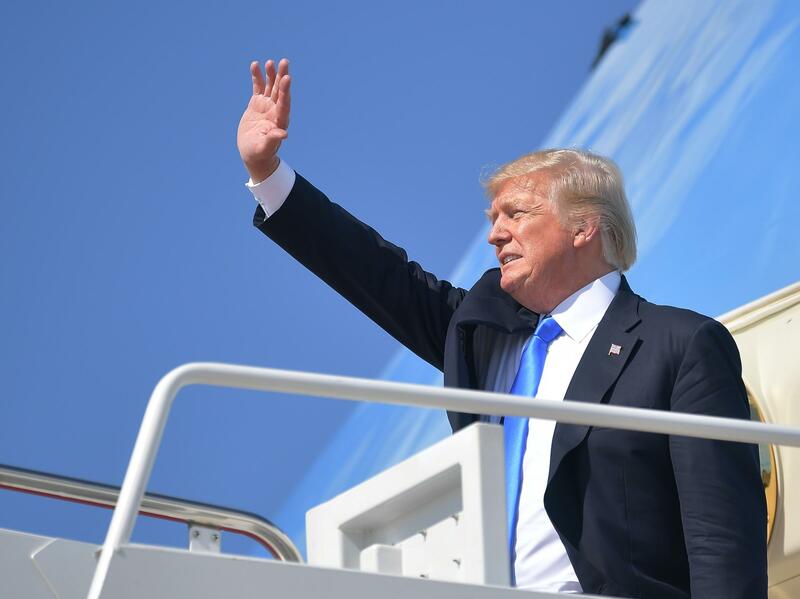 President Donald Trump boards Air Force One before departing from Andrews Air Force Base in Maryland on June 9, 2017. A nonprofit group's claim that President Trump is violating the Emoluments Clause of the U.S. Constitution should be dismissed because the plaintiffs have no standing to sue, according to a court filing by the Department of Justice. "Those claims falter on threshold grounds: no Plaintiff has alleged an injury" that meets the standing requirement, the DOJ says in a document submitted in federal court. The administration's argument is a response to the lawsuit filed in January in the Southern District of New York by the Citizens for Responsibility and Ethics in Washington. The suit claims Trump is violating the Emoluments Clause whenever foreign entities book rooms at the Trump D.C. hotel or lease Trump office space. The Emoluments Clause bars presidents from taking money from foreign governments. "These violations of the Foreign Emoluments Clause pose a grave threat to the United States and its citizens. As the Framers were aware, private financial interests can subtly sway even the most virtuous leaders, and entanglements between American officials and foreign powers could pose a creeping, insidious threat to the Republic." The suit cites numerous examples of how Trump personally stands to profit from doing business with companies linked to foreign governments. For example, the Industrial and Commercial Bank of China, which is owned by the Chinese government, is a tenant at Trump Tower in New York, and its lease is due to expire during Trump's term, the suit says. That means the Chinese government would be in negotiations with the Trump Organization to renew the lease — and it might agree to extremely favorable terms that, in effect, would be a financial gift to the president. "CREW, which avers that the President's conduct is in conflict with its mission of preventing official corruption, has proffered only an abstract injury of the sort long held insufficient to confer standing," the administration's filing says. "It's clear from the government's response that they don't believe anyone can go to court to stop the president from systematically violating the constitution. We heartily disagree and look forward to our day in court," CREW's Communications Director Jordan Libowitz says in a statement about the administration's motion. Friday's White House response is just one of many legal steps that would have to be taken before a court could decide the case. The next step will involve CREW responding to the administration's filing, and on it will go as it makes it way through the court. The CREW suit was filed by legal scholars and former White House ethics officials, including Richard Painter, ethics adviser to President George W. Bush; Harvard Law School professor Laurence Tribe; Erwin Chemerinsky, dean of the law school at the University of California, Irvine; and Supreme Court litigator Deepak Gupta.